Steel Chemist (#252037) (1943-1971), 492-foot steel ship built in Pasagula, Missippi by Ingalls Shipbuilding Corp for the U.S. War Shipping Administration as the Sea Dolphin. She was converted three times more before her stranding on San Nicolas Island: to the U.S.S. 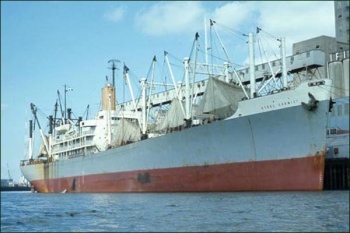 Leon for the U.S. Navy as a Combat Loaded Transport; to the Sea Dolphin for the U.S. Maritime Commission; to the Steel Chemist owned by the Isthmanian Lives, Inc. of New York. On April 10, 1949 on a voyage from Hong Kong to New York, in the early morning in a dense fog, she ran aground at San Nicolas Island with a cargo of sugar and ten passengers. All the vessel's double-bottom tanks flooded. Passengers and cargo were removed, and on April 15, 1949 Steel Chemist was refloated and taken to New York. 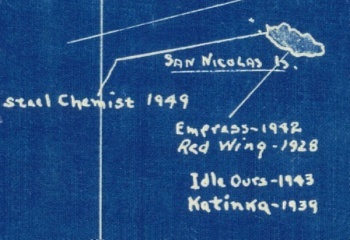 Shipwreck listed for San Nicolas Island hand-drawn on a map entitled Marine Disasters, Strandings and Wrecks of Vessels on the Coasts of California, Oregon and Washington, compiled and traced by Lt. Comdr. W. A. Mason, U.S.N., San Pedro, Cal. 1939. Copyrighted March 1939. Revised Aug. 1946, Aug. 1947, April 1949.